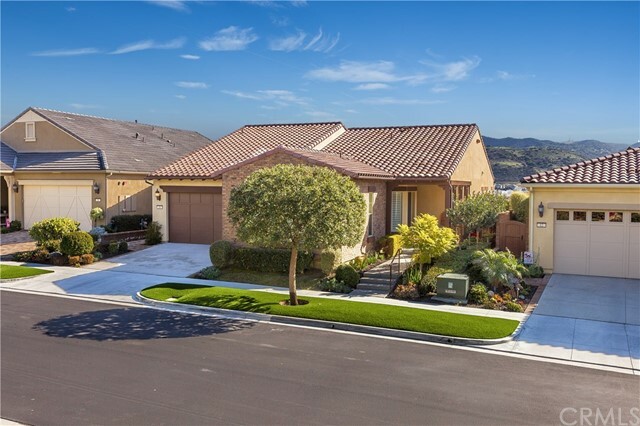 All Rancho Mission Viejo homes currently listed for sale in Rancho Mission Viejo as of 04/18/2019 are shown below. You can change the search criteria at any time by pressing the 'Change Search' button below. If you have any questions or you would like more information about any Rancho Mission Viejo homes for sale or other Rancho Mission Viejo real estate, please contact us and one of our knowledgeable Rancho Mission Viejo REALTORS® would be pleased to assist you. "AWARDED BEST MASTER PLAN COMMUNITY IN THE COUNTRY 2019! 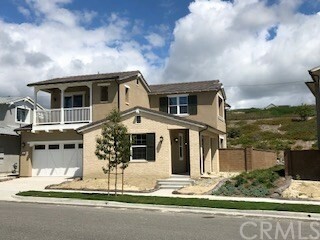 TURNKEY FURNISHED, NEW Construction home within Rancho Mission Viejo s Alondra at Escencia Collection. The bright & open one-level design is move-in ready & fully upgraded with interior design & furnishings by Henry West Designs. Two bedrooms & 2.5 baths are featured, & living areas reveal an office & a great room that is ideal for entertaining. GE Monogram appliances shine in a gourmet kitchen with a quartz island & countertops, and built-in Sub-Zero refrigerator. The model-caliber residence spans approx. 2,344 s.f. and displays upgraded European Oak hardwood flooring, upgraded cabinetry and countertops throughout, custom carpentry, custom lighting, designer paint, ceiling fans, a security system, Electrolux washer-and-dryer set, on-demand hot water system, custom wood shutters, motorized Sunscreen Roller Shade & SoftFlo Whole House Water System. Sophisticated elegance awaits in a master suite with luxurious bath, quartz countertops & backsplash, and customized walk-in-closet. Two 4-panel folding doors open up to an impressive outdoor retreat with custom fireplace a tongue-and-groove wood ceiling & sweeping views. The award-winning landscaping talents of Roger s Gardens are on display throughout the grounds & hardscaping is complemented by a Lynx BBQ & an outdoor kitchen. Reserved for homebuyers 55 & better. The Resort Lifestyle & amenities awaits you! *$300K plus in interior/exterior upgrades and custom furnishings!" "**NEW CONSTRUCTION!! MOVE IN READY!! 3558 square foot of single level living! 4 bedrooms, 4.5 baths, and 3 car tandem garage on single loaded street. Upgraded finishes selected by our in house Designer. New Construction in Rancho Mission Viejo by The New Home Company. 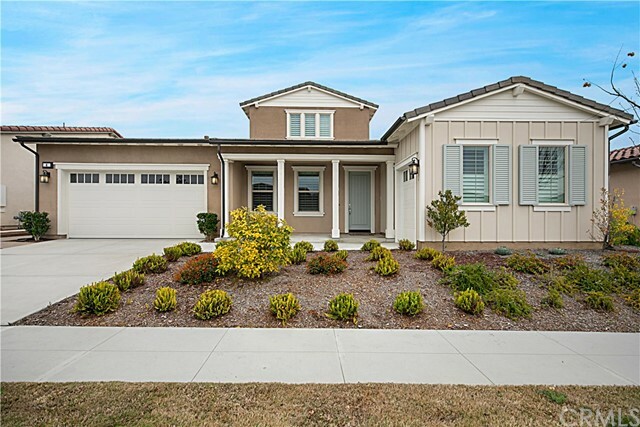 Enjoy acres of community open space and countless community amenties within a short drive to the coast. The stunning Plan 2 floorplan features an oversized 15 ft. kitchen island for entertaining, french sliders for backyard access, 10 ft. ceilings, and all secondary bedrooms with ensuite baths." 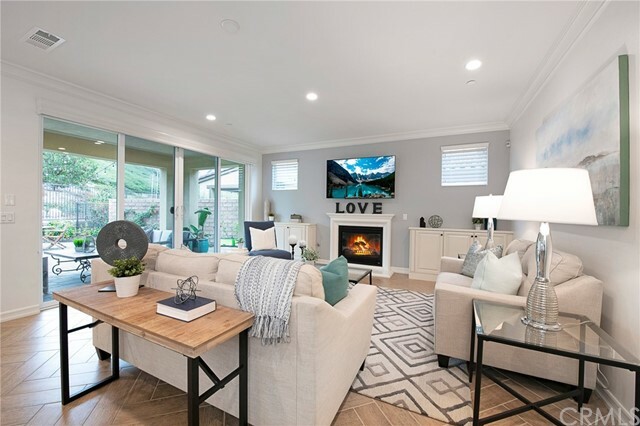 "Beholding the rewards of near-new construction and a lengthy list of luxurious custom upgrades, this spacious Craftsman-inspired residence is ready to enhance your lifestyle in Rancho Mission Viejo. A towering ceiling with ultra-modern chandelier complements the open-concept home s entry, which provides passage to a dedicated office, 4 ensuite bedrooms including one on the first floor, and 4.5 baths in a floorplan measuring approx. 3,407 s.f. Powered by an owned solar system, the model-caliber residence is accentuated with disappearing sliders that open the home to the outdoors, wood-look plank tile flooring, upgraded Shaker cabinetry, a stacked-stone widescreen fireplace, tankless water heater, and a 3-car garage with epoxy floors. Centered around a massive island with seating, the kitchen features quartz countertops, a walk-in pantry, stainless steel farmhouse sink, and pro-level stainless steel KitchenAid appliances. A dramatic semi-circular staircase with custom rail leads upstairs, where residents will discover an airy loft, and a master suite with large view deck, custom marble and oversized walk-in closet. Panoramic hill, valley and city-light views enhance the beauty of newly finished grounds that boast more than $200,000 in improvements, including a gated entry, a new pool and raised spa, built-in BBQ, a covered California room, synthetic turf and drought-resistant landscaping, rock and brick hardscape finishes, and upgraded tile patio surfaces." "AWARDED BEST MASTER PLAN COMMUNITY IN THE COUNTRY 2019! New Construction, Superior view lot in Alondra-Esencia Hilltop neighborhood! SINGLE-LEVEL LIVING w/optional bonus room & loft. Highly desirable plan 2 has been completely upgraded! First impressions are lasting thanks to a dramatic two-story entry w/custom wainscoting. Open the multi stacking glass doors & benefit from the expansive views creating an indoor/outdoor living area. This elegant home offers approx. 2,957 s.f. centered around a massive great room with outdoor retreat, the main level hosts 3-bedrooms, one as an office option, 2 full baths, powder room, spacious kitchen, & craft room. The upper level includes a loft, bonus room, & powder room. The upgrades are endless including custom 24X48 porcelain tile flooring throughout, custom wainscoting at entry, office, powder room & master, custom door casings, window wrap, crown molding & base throughout, quartzite counter tops in kitchen w/full wall backsplash, maple cabinets, quartz in all bathrooms including custom shower design, Provenza wood stairs & flooring in loft & bonus room, built-ins, upgraded electrical and so much more! Must see to truly appreciate. Located in an idyllic location just 5 miles from the coast & situated between the sister communities of San Clemente & San Juan! Enjoy a resort lifestyle with extensive amenities. MUST SEE IN PERSON TO TRULY APPRECIATE ALL THE UPGRADES AND VIEW!" 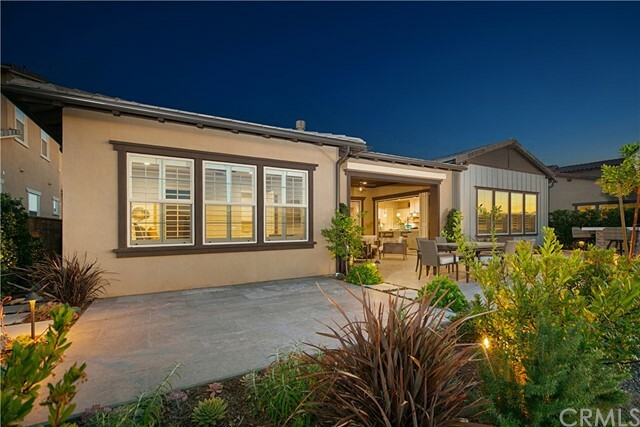 "Welcome to Del Webb and the highly desirable community of Gavilan-Sendero. This stunning Plan 3 single story home has the most exquisite finishes you will find anywhere. 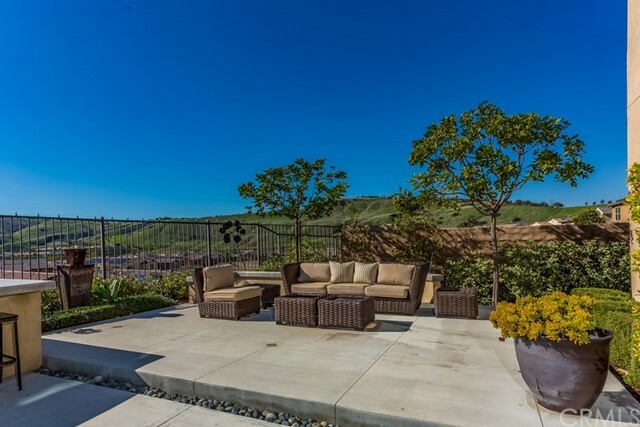 The end of cul-de-sac location & panoramic views from the highest street are second to none. Exterior yard has a California Room with fireplace & mounted TV. Garage has been extended by 4 w/ sealed floors & custom cabinets. Alder wood front door with beveled glass is stunning. There is private dining room w/custom designed stone wall. The Chef s dream kitchen w/granite & stone, Sub Zero refrigerator, SS appliances incl. oven range with professional gas cook top & separate warming drawer. There is a large island with a single basin sink & breakfast bar seating. The wet bar has a bar sink, a wine frig & seating. The family room & the hearth room each with own fireplace surrounded by custom built-ins. Home approx. 2,475 square feet of living space, 2 Bedroom + Office/3rd Bedroom. The office has custom built-ins. Master Bedroom has 4-foot extension of living space. The Master Bath with Spa/Whirlpool tub, seamless glass low threshold shower & walk in closet with custom built-ins complete this luxurious suite. The second bedroom is en-suite. There are custom window coverings throughout, along with wood flooring, carpeting in bedroom & Travertine flooring where appropriate. There are door casings and crown molding throughout that adorn this amazing home which shows as a masterpiece of craftsmanship and design." "Welcome to the pinnacle of the highly sought-after neighborhood of Del Webb. 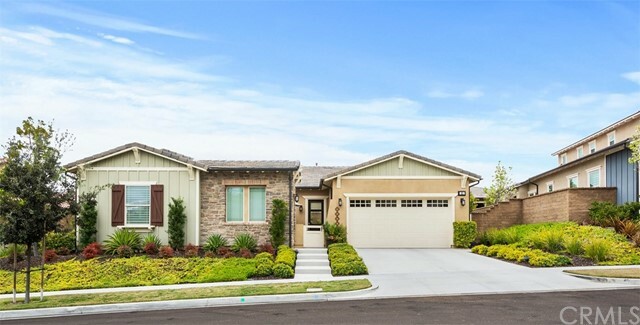 Located in the exclusive gated community of Gavilan-Sendero where only 50 Del Webb homes were built in this beautiful, active, 55+ neighborhood. The panoramic view lot is located on the highest street in the community, on a single loaded, close knit, cul de sac street that has only 14 homes. Beautiful, modern, open concept home with 10' high ceilings & 8 ' tall doors give the home a very spacious feel. Two bedrooms and office plus an optional builder extension of an 8' x 14' Sunroom. The Great Room has wall to wall bi-fold doors that open to the exterior California Room that invites outdoor living. The Great Room also opens to the dream kitchen, casual dining area & sun room which are perfect for open concept entertaining. These rooms, plus the master bedroom have fabulous, unobstructed, panoramic views. The dream kitchen has quartz countertops, upgraded stainless steel appliances that include; professional 6 burner range top, convection oven, microwave and refrigerator. Decorated with beautiful, neutral Travertine floors, plantation shutters, crown molding & two tone paint. The gated community has exclusive Adult only amenities with resort-style clubhouse, bar, fitness center, yoga studio and salt water pool & spa. There are a variety of 55+ clubs & social events. Your membership also gives you access to all of the family facilities in Sendero & Esencia, perfect for when family is visiting." 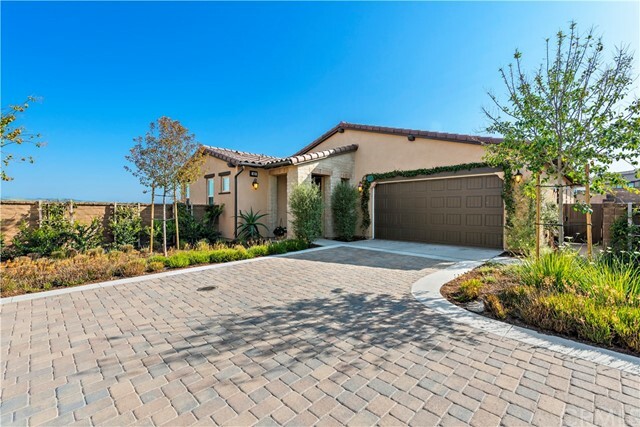 "This unique property is the best of the Ryland homes in Sendero. Must see to believe all the designer details and professional upgrades! From this homes high perch are fantastic mountain, sunset and village views. This premium lot is an end unit with only one neighbor. Over $150,000 in builder upgrades, plus another $250,000 in after purchase upgrades were added to this home. As one enters this semi-custom home you experience the light and bright interior. Downstairs is one bedroom, currently being used as an office. Custom wood built ins, paneling and accents add to the sophistication in most rooms. The yard is hardscapped with natural stone, BBQ buffet, fountain, and seating wall. Softscape includes vegetable garden, multiple fruit trees, and grape vines under the custom arbor. From the master balcony one can fully appreciate the special neighborhood of Sendero in Rancho Mission Viejo. Residents of Sendero can enjoy all ammenities in Rancho Mission Viejo. Ammenities include, community farms, fitness centers, club houses, resort style pools and spas, putting green, bocce ball courts, fire pit, playgrounds, coffee shop, arcade and so much more!" 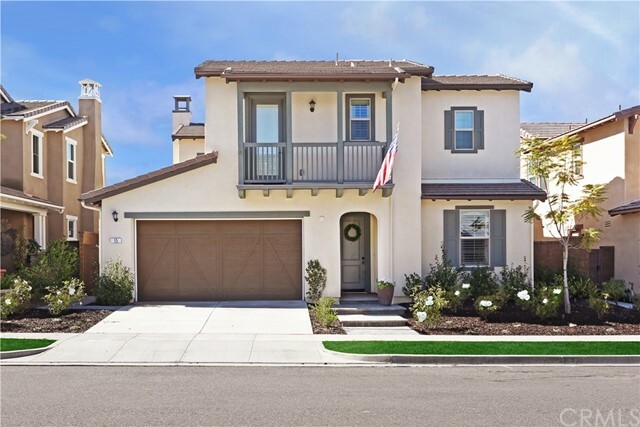 "From its prized location and unique floorplan to more than $100,000 in luxurious upgrades, this bright and modern residence presents an exceptionally rare opportunity in Rancho Mission Viejo s 55-and-better community of Cortesa. Its premium lot is one of the largest in the community, measuring nearly 10,237 s.f., complete with paid & approved landscape plans. Enjoy panoramic views of rolling hills, rare privacy, open space & a unique short walk to The Hill Top Club. Comfortably sized at approx. 2,121 s.f., the open-concept single-level design stands out at Cortesa offering the plan s optional 3rd bedroom, creating a total of 2 ensuite bedrooms plus a 3rd full bed and 3rd full bath. Entering the home, guests are immediately impressed with stylish appointments, including Provenza hardwood floors, chic tile flooring in select areas, crown molding, electric window shades, plantation shutters, white cabinetry with honed marble countertops throughout, and Epoxy flooring in the attached 2-car garage with built-in cabinetry. Enjoy a great room with built-in entertainment center and slide-away glass doors to a fireplace-warmed loggia, and a chef s kitchen with expanded semi-circular island, farmhouse sink, walk-in pantry and stainless steel appliances. Picture windows frame serene views in the master suite, where homeowners will appreciate custom floating shelves, a walk-in closet with mirrored door and furniture caliber built-ins, a sit-down vanity, and a floor-level no step shower." 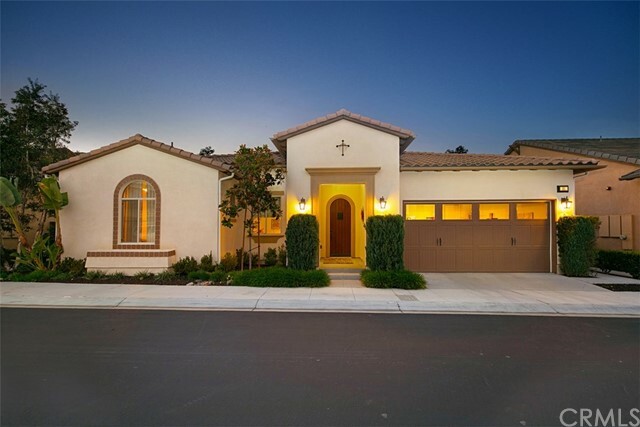 "Welcome to this stunning Rancho Mission Viejo Esencia home boasting 4 bedrooms each with private bathroom and walk-in closet, guest powder bath plus a formal dining room/library, upstairs loft and pocket office plus a 3 CAR GARAGE. The Master suite was designed with luxury in mind with his and hers walk-in closets, large step-in shower, oversized soaking tub and separate quartz topped vanities. Enjoy the nightly sunset views from the master suite deck! The large secondary bedrooms are all appointed with walk-in closets and their own bathrooms, two with tub and shower and the downstairs suite with step-in shower. Large loft upstairs adjacent to the pocket office with built in desk. Also a convenient upstairs laundry room with sink. Cooking and entertaining reigns with KitchenAid stainless steel appliances including the double oven and professional grade 6 Burner range, farm sink, microwave/convection oven, refrigerator plus gray glazed cabinetry and quartz counters and large island. Great Room concept downstairs showcases the beautiful wood floors, plantation shutters and focal fireplace. The formal dining room makes a great library or office. View yard with covered loggia, firepit and maintenance free turf. The icing on the cake is the 3 CAR GARAGE. Energy efficient home is equipped with spray foam insulation, tankless water heater, pex pipes and the latest appliances. Enjoy Resort Style Amenities including pools, pool bars, gyms, parks, trails and new Esencia School." 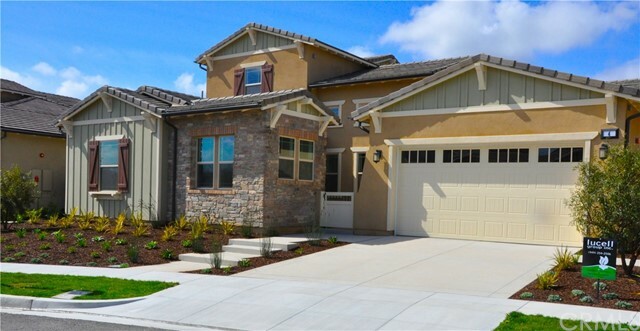 "Beautiful single story Del Webb home located in the very desirable gated section of Gavilan. This home is nestled at the top of rolling foothills on a panoramic view lot and single loaded street. Two master suites add to the desirability of this home, plus one bedroom as a den option. Features include a very spacious and open floor plan with expansive 10' high ceilings and 8' interior doors. Light toned hardwood flooring, ceiling fans and custom plantation shutters and shades throughout. Gourmet kitchen is anchored by an oversized island with Quartz counters, stainless steel Kitchen Aid appliances & beautiful raised panel cabinets that extend into the dining room with a built-in desk. Super laundry room features 105 long quartz counter work station, custom bench & cabinets galore. Enjoy the expansive views from your master bedroom featuring master bath with dual sink vanity and quartz counters. Backyard is ready for entertaining with a covered patio, ceiling fan, Brazilian Hardwood decking and custom pavers, firepit, bbq and amazing views! As a Gavilan resident you will enjoy a Private resort-style clubhouse with bar, fitness center, heated salt water pool, spa & cabanas, bbq area and a variety of clubs and social events. Don't miss this opportunity to live in a community with a carefree approach to living that means more time for the good stuff. And there s a lot of good stuff!" "This is a brand new Monterrey exterior styled plan 2 from 'Briosa at Esencia' by William Lyon Homes. This home features a beautiful 4 bedroom plus office lay out with a private pool sized backyard. The lot benefits from an extra wide side area making it bigger than most. And provided extra room between you and your neighbor. 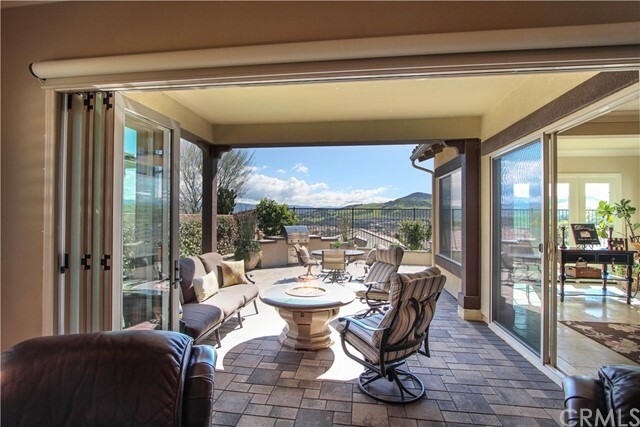 The private loggia off the great room provides that desired indoor/outdoor California lifestyle. Upgrades include Quartz Counter tops, custom Back splash in the kitchen, quartz counters in the Master Bathroom, stainless steal KitchenAid Appliances including built-in fridge, microwave, cook top with hood vent, wall oven and dishwasher. The home features wood flooring downstairs, upgraded tile in the laundry and baths and carpet in the bedrooms. Enjoy the amenities of the Master Planned Esencia in Rancho Mission Viejo. Private community amenities include the Hilltop Club with Pools, Indoor and outdoor exercise Gyms, Bocce Ball, Firepits,Lounge with a bar and great view! !, Arcade and Community Rooms. Your furry friend will enjoy meeting up at the South Paw dog park." "SINGLE level absolutely stunning home! Located in a 55+ neighborhood of Alondra in Escensia, this home is better than a model home with too many upgrades to mention them all and you really must see to appreciate! 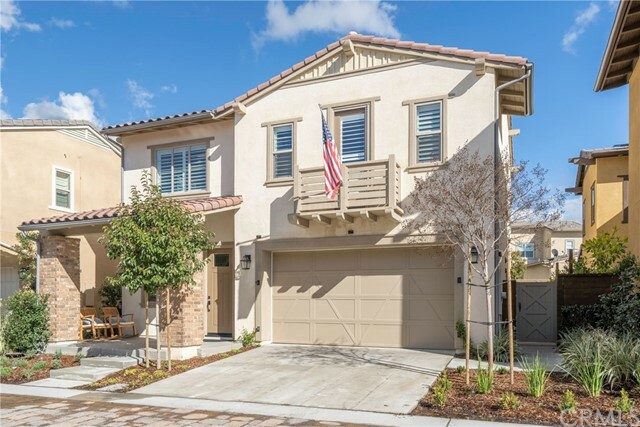 Built in 2016 this home has barely been lived in and has gorgeous wood flooring through out, custom window treatments with clean white blinds and shutters, built in high end refridgerator, gorgeous Caesarstone countertops and large island, high end washer and dryer included, beautiful mounted tv's included, built in cabinetry, California built in closets, upgraded doors to den with privacy blinds for use as a third bedroom if needed, 5 baseboards, recessed lighting,epoxy garage flooring and upgraded cabinets, beautiful master bath with large shower and upgraded enclosure with nice jacuzzi tub, upgraded front door as well as additional door from master bedroom to back yard, California patio with upgraded fan and lighting, artificial turf area in back for doggies, beautifully landscaped including fruit trees and so much more! Enjoy all this neighborhood has to offer with social events, Canyon Coffee at The Canyon House, lots of indoor outdoor areas, Esencia Farm, hiking in Oak Canyon. pool and water play area with outdoor BBQ dining areas, dog park and more." "Rancho Mission Viejo has never looked so good! Located on a private corner lot, this former model home has breathtaking views of the Ortega foothills, featuring 3 bedrooms, 2 1/2 baths, a loft and an office (that could be converted to a 4th bedroom). Volume ceilings, and windows that provide plenty of natural light with a captivating fireplace welcome you home. This highly sought-after open concept floor plan boasts scores of custom upgrades including a Gourmet Chef s Kitchen with three ovens, upgraded cabinetry, and wine fridge. This energy-friendly smart (e4 control system) home is equipped with solar panels, water-softener system, & surround sound speakers. The master bedroom has coffered ceilings with a slider door that opens to the expansive deck, his & her walk-in closets w/custom built-ins. The master bathroom, accented with gorgeous backsplash and tile, has an oversized bathtub & shower. Two additional bedrooms, w/custom built-in closets, share a Jack-and-Jill bathroom. Loft and large laundry room provide ample cabinet space. The downstairs has tile throughout with an oversized office w/custom built-ins, new carpeting and half a bath. The backyard features a firepit, infrared BBQ, outdoor refrigerator, synthetic turf & a private oversized side yard. The garage is complete with epoxy floors, built-in cabinetry/storage racks/private closet for extra storage. This home is a stone s throw away from the putting green, park, pool & clubhouse, don't miss virtual tour link." "AMAZING NEW PRICE!! Welcome to 52 Corazon, a spectacular updated residence in the award-winning community of Rancho Mission Viejo. Located on a premium lot with PANORAMIC HILLS VIEWS, this highly sought after floor plan offers gracious living in a warmly designed interior with classic finish wood laminate flooring & custom moulding details throughout. The downstairs great room layout with cozy fireplace is perfect for entertaining family & friends & opens to the huge center island kitchen, finished with gorgeous light granite countertops, crisp white cabinetry, & stainless steel chef-grade appliances. A spacious butler s pantry is perfect for a coffee bar & the walk-in pantry has room for everything. A private guest bedroom with en suite plus a powder room complete the first floor. Upstairs, 2 spacious guest bedrooms share a hall bathroom & the loft is ideal flex space. The private master suite enjoys stunning panoramic hills views plus a fabulous en suite & custom built-out walk-in closet. Outside, the over-sized yard features custom BBQ/bar, multiple seating areas, & plenty of grassy play area. A prime cul-de-sac location means ultimate privacy with neighbors on just one side. Rancho Mission Viejo residents enjoy unparalleled amenities including resort-style pools & spas, community farms, fitness centers, clubhouses, putting green, playgrounds, bocce ball, coffee shop, arcade, & the brand new K-8 Esencia school plus so much more. Your best life starts right here!" 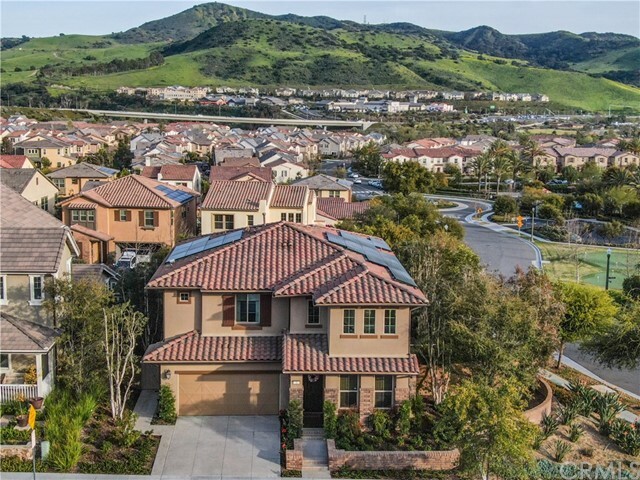 "Situated in the highly desirable master-planned community of Rancho Mission Viejo, this residence sits in the most desirable and unique location in all of Esencia. 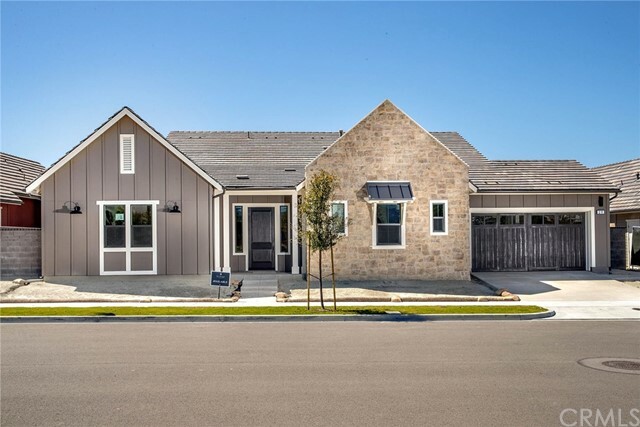 Designed and built by Meritage Homes, and located in their acclaimed Cirrus neighborhood, this nearly new home is within walking distance to Esencia School, the Pavilion Recreation Center, parks, trails, the Canyon Coffee House, and much more. Adding to its desirability, the home sits in an elevated position that affords breathtaking hillside and sunset views. The rare western-facing orientation floods the home with natural light. Less than one-year-old, the home features designer upgrades and finishes throughout including book-matched natural stone quartzite countertops and backsplash, wide plank porcelain tile floors, lacquered maple cabinets, electric car charging station (along with many other green features), Professional KitchenAid cooktop and appliances, and many other fine appointments. The oversized great room leads to a wonderful covered patio ideal for outdoor entertaining throughout the year. The spacious yard and gardens wrap around to include a second covered patio. For those who desire a pristine and new residence (less than one year old) with exceptional upgrades, this one is not to be missed." "Tucked away on a serene, private location this highly upgraded 5 bedrooms, 3 bathrooms residence expresses the perfect combination of modern and luxurious living. The finest finishes have been selected to complete this remarkable home! On the main level is a chef s kitchen which provides the ideal atmosphere and amenities for entertaining with a large granite center island, beautiful upgraded cabinets, farmhouse sink, high-end Kitchen Aid appliances, granite counters with full backsplash, six burner cooktop with a custom range hood that includes a built-in heat lamp & two large ovens, walk-in pantry & a pocket office with built in desk and cabinets. The great room includes a cozy fireplace and large sliding doors that lead to the outdoor California Room. A dining area, main level bedroom with Murphy bed & full bathroom complete the lower level. Traverse to the upper level to enjoy the Master Suite which includes a private, expansive deck, a luxurious soaking tub, over-sized shower, His and Hers walk-in closets & vanities. There are three spacious secondary bedrooms which all have privacy. The grounds have been lovingly maintained and ideal for entertaining guests and enjoying the tranquil surroundings. The Esencia area offers the very best in community amenities! Meritage Builders has received the EPA s highest ENERGY STAR award for a 7th straight year. Walking distance to the Esencia Middle School. The house is priced to sell!! Don t miss this opportunity!!" 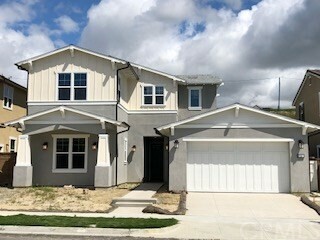 "Stunning 55+ Active adult single level style living in this newer construction home in Alondra at Essencia. Offering approx. 2,650 SF of living space with 2 Bedroom 2 full baths and 2 half baths plus den. All main living spaces and bedrooms are downstairs featuring a spacious bonus loft upstairs. Awe inspiring California room with Caribbean doors features a fireplace and is wired for sound for the best in indoor/outdoor entertaining. The Chef s kitchen has been recently upgraded with custom Cambria Crowndale Quartz counters and backsplash, ceiling height cabinets with glass and accent lighting plus an oversized center island and pantry. Master suite with spacious walk in closet and a spa-inspired bath with separate shower and soaking tub. Upstairs, the entertaining continues with an oversized bonus room. The two car garage features epoxy flooring and amazing custom cabinetry with an additional garage for storage or for golf cart/motorcycle. The home has been beautifully landscaped with manicured plants and stone pavers. The Ranch offers a wide array of activities, amenities and events for both Active Adults and guests including The Club, with Pool, Spa, 2,000 SF Gym, Cocktail Bar, and more." "This beautiful newly constructed home is a must see! The highly upgraded home has 4 Beds, Loft, 3 Bath with 2 car-garage. It also features an extended Ranch Room and Casita in the back of the home to use as your imagination room. The home has White Cabinets throughout, gourmet kitchen with Stainless Steel Appliances, large pantry with upgraded counter-tops and back splash. The home is freshly painted with beautiful shutters and upgraded flooring through-out. 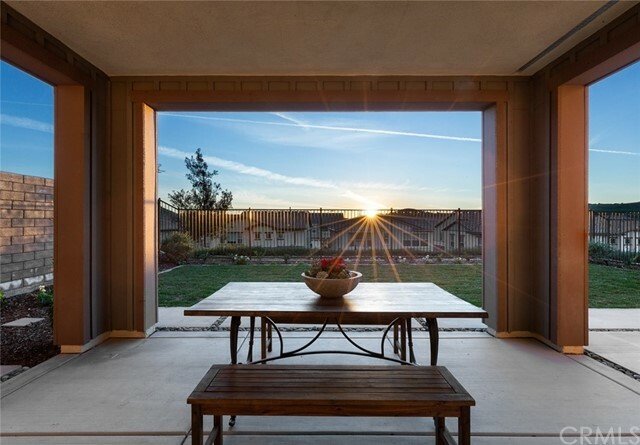 This home reflects today s trends in home design and outside this two-story Adobe Ranch home adds an element of authentic California grace with it's open floor plan of 2,895 - square foot. Throw open the sliding glass doors and life flows seamlessly between indoors and out. On the first level, a full bedroom and bath are ready for overnight guests or a teen on the edge of independence. Venture upstairs and relax in a loft designed as a private family retreat or discover a zone of tranquility in the spacious master suite with its walk-in closet and spa-like bath. 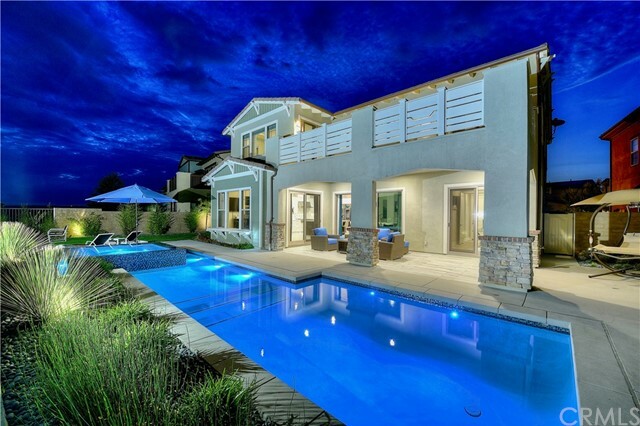 This home is located in the highly desirable Viridian at Esencia Village of Rancho Mission Viejo and won't last long." "'Briosa at Esencia' by William Lyon Homes offers a brand new beautiful 3 bedroom plus bonus room home with a downstairs master bedroom. One of the rare new homes with a landscaped front yard installed. This home is located on a cul de sac street. Upgraded features include Great Room with stacking doors leading to a covered outdoor loggia, designer selected kitchen countertops and backsplash, Master Bathroom stone counters, stainless steel KitchenAid Appliances including built-in fridge. Upgraded luxury vinyl plank throughout downstairs areas with tile flooring in the baths and laundry room, and carpet in the bedrooms throughout the home. Enjoy all the amenities that the Master Planned Rancho Mission Viejo offers including the Hilltop Club with Pools, Gym, Bocce Ball, Firepits, Arcade, bar with lounge seating and Community Rooms. The area also has extensive hiking and biking trails connecting the foothills to the sea. Plus the brand new Esencia School! One of the last chances to own a new single family home in the Best Master Planned Community in the nation." "'Briosa at Esencia' by William Lyon Homes offers a brand new beautiful 3 bedroom plus bonus room home with a downstairs master bedroom. One of the rare new homes with a landscaped front yard installed. This home is located on a cul de sac street. Upgraded features include Great Room with stacking doors leading to a covered outdoor loggia and grassy back yard, designer selected kitchen countertops and backsplash, Master Bathroom stone counters, stainless steel KitchenAid Appliances including built-in fridge. Upgraded wood throughout downstair areas with tile flooring in the baths and laundry room, and carpet in the bedrooms throughout the home. 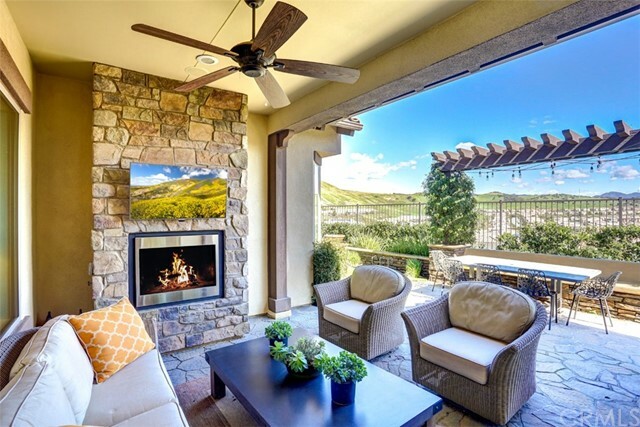 Enjoy all the amenities that the Master Planned Rancho Mission Viejo offers including the Hilltop Club with Pools, Gym, Bocce Ball, Firepits, Arcade, bar with lounge seating and Community Rooms. The area also has extensive hiking and biking trails connecting the foothills to the sea. Plus the brand new Esencia School! One of the last chances to own a new single family home in the Best Master Planned Community in the nation." "'Briosa at Esencia' by William Lyon Homes offers a brand new beautiful 4 bedroom home with a downstairs master bedroom. This home is located on a cul de sac street. Upgraded features include Great Room with stacking doors leading to a covered outdoor loggia, designer selected kitchen countertops and backsplash, Master Bathroom stone counters, stainless steel KitchenAid Appliances including built-in fridge. Upgraded wood throughout downstair areas with tile flooring in the baths and laundry room, and carpet in the bedrooms throughout the home. Enjoy all the amenities that the Master Planned Rancho Mission Viejo offers including the Hilltop Club with Pools, Gym, Bocce Ball, Firepits, Arcade, bar with lounge seating and Community Rooms. The area also has extensive hiking and biking trails connecting the foothills to the sea. Plus the brand new Esencia School! One of the last chances to own a new single family home in the Best Master Planned Community in the nation." 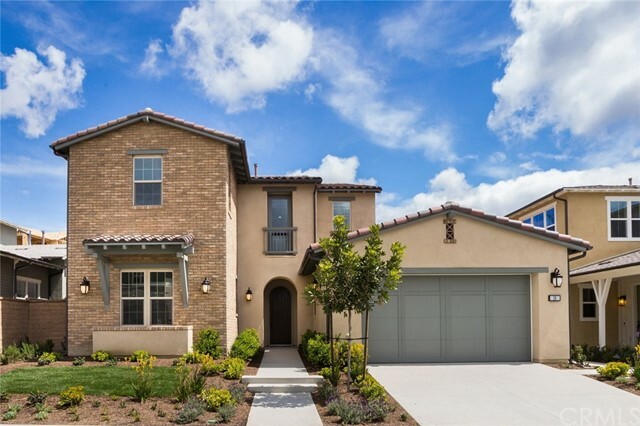 "Take a look at this beautiful turn-key house in Heirloom at Esencia in Rancho Mission Viejo! 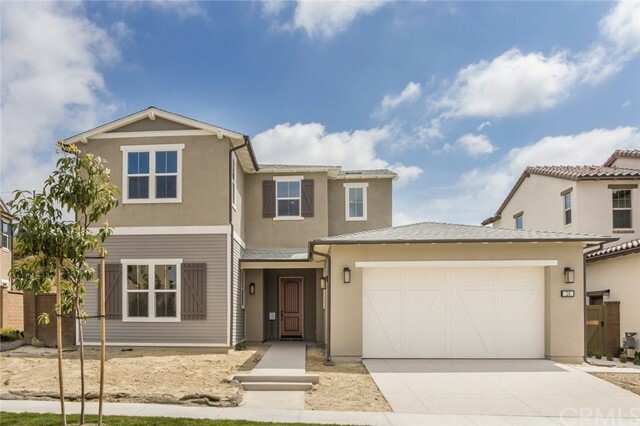 This home offers 3 Bedrooms and 2.5 Bathrooms with over $100,000K in builder upgrades! Natural light floods this home! All bedrooms are upstairs, with a 1/2 Bathroom downstairs. As you enter the home, you will notice the immaculate interior finishings, vaulted ceilings, hardwood floors upstairs and downstairs and plantation shutters. The kitchen is stunning, with a extra large kitchen island, Granite counter tops, tile backslash, Stainless steel appliances, built in range, double ovens and built in refrigerator. In addition, there is a Butlers Pantry with a wine fridge, extra cabinets and a counter top. The Kitchen opens up to the spacious living room, with a Panoramic Slider, that leads out to the fully finished and landscaped backyard that has grass and a fire pit! Master bedroom is spacious, and Master Bathroom is gorgeous with a deep soaking tub, walk-in shower, and walk-in closet. Remaining 2 bedrooms share a Jack and Jill bathroom with dual sink vanity. In addition, there is a loft upstairs. Whole home speaker system with surround sound in the living room, along with an outdoor speakers! 2 car attached garage with Epoxy garage flooring. Laundry room is conveniently located upstairs. The community offers so much with, pools, parks, walking trails, schools, sports complex, dining and entertainment options, and centrally located to transportation links! Don't miss the 3D Tour." "Don't miss this amazing opportunity to pick your own upgrades, and be a part of the beautiful Rancho Mission Viejo Community of Escensia! 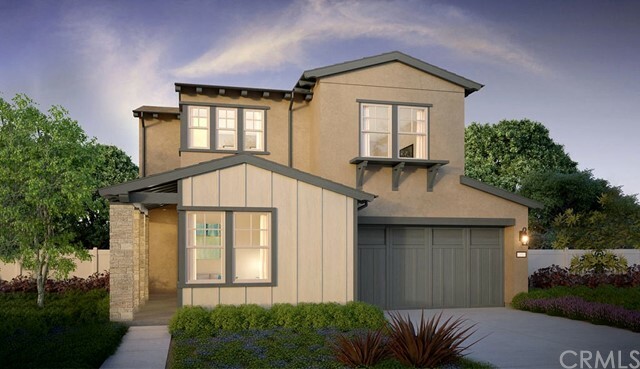 Alondra, by Shea Homes, is a 55+ community featuring single level homes with 10 foot ceilings. This home site is available for purchase now. Purchase this home site, personalize the interior with your individually selected options, and your finished home will be ready for move-in approximately October/November of 2019." "Ideally located in the exclusive gated enclave of Gavilan in Sendero, this home exemplifies luxury active 55+ adult lifestyle in a resort-style environment. The open & bright single level design is move-in ready and fully upgraded and features 2 bedrooms, a den and 2.5 bathrooms. The great room has wood laminate floors and opens to the large kitchen with large island, designer backsplash and appliances. Professionally designed tranquil backyard with fireplace and water feature is the entertainer s delight. The covered patio also features an electric curtain awning and mounted TV. Enjoy sophisticated elegance in the private clubhouse with bar, entertainment area, fitness center, yoga studio, exercise classes, water aerobics, BBQ area and a beautiful pool that is heated every day of the year. HOA membership also includes access to all other clubhouse and pool facilities in Sendero and Esencia."